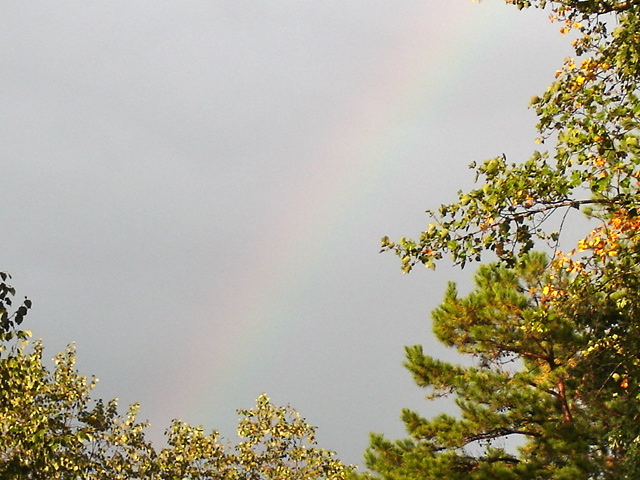 Rainbows and Promises – God's Grace ~ God's Glory! A rainbow is a symbol of God’s grace. We don’t usually find one if we are looking for one. They come with no planning on our part. This one appeared while the sky was still very cloudy. And only then, through a small sweep of the sky between the trees. Had I not been been looking through the kitchen window at a certain moment I would have missed it. And even then it was very dim, disappearing soon after I took this picture. Why does God continue to display a rainbow? What good is it, actually, and practically? What is its purpose except to cause us to look, and in seeing, remember our heavenly Father’s promise to Noah and his sons, recorded in Genesis 9:11-16.
beware lest ye also, being led away with the error of the wicked, fall from your own stedfastness. “And he that sat was to LOOK upon like a jasper and a sardine stone.